It's my birthday - Hurray! I've not done a blog post about birthday makeup in the recent years, but as it's my 21st I thought I would share with you the special effort I will be making. Obviously, my first goal is to create a flawless, radiant looking base which I feel starts with a good skincare routine. Exfoliation before makeup application is becoming a regular occurrence as I just can't beat how well it picks up my complexion and makes my foundation go on smoother. I like to apply a moisturiser and face oil combination a few hours before my makeup to ensure that my face is hydrated and there's no risk of my base slipping off my face. To ensure that my base is set and primed, I'm going to be using the Glossier Priming Moisturiser and then a few spritzes of the Urban Decay All Nighter Setting Spray as I like to use it underneath my foundation to ensure that it stays put. Then, I go in with the Too Faced Born This Way Foundation which covers and conceals, making for a flawless, yet natural looking base. It's super buildable and when blended in using a beauty blender, it can be super high coverage if you would like it to be, yet without caking. A perfect addition to my base routine is the Kat Von D Lock It Concealer, a medium to high coverage offering which helps to conceal any blemishes or imperfections with a quick swipe. As for cheeks, I'm going to do a full contouring routine, but instead of trying out anything new, I want to stick to my trusty Charlotte Tilbury Bronze and Glow Palette to chisel my cheekbones and add all the right shadows, in all the right places. Highlighter is important to me to give a dewy look, but I don't want anything that can look too glittery. I'm opting for two, starting with a pat of the Glossier Quartz Haloscope and setting it using the Too Faced Love Lights Highlighter. To add colour to my cheeks, I'm keeping it fairly neutral, opting for the Hourglass Ambient Lighting Blush which is super natural and goes with a variety of looks. I want something that isn't too glittery as I'll be under restaurant lights, but I want something I feel comfortable in. For eyes, I have been debating whether to pull out an old favourite, but in the end I'm going for my trusty Urban Decay Naked Palette*. I don't want anything too dramatic, but I feel like the bronze shades are complimentary to the rest of my makeup. I am also tempted to go for the Charlotte Tilbury Dolce Vita Palette as it's great at dressing up a makeup look and making my eyes look smokey, but without running the risk of colours clashing. I've had a tough time picking out my lipstick because although I wanted to pick out a red offering, it won't be practical when we're going out for a meal and I know I'll be consuming all of the food. 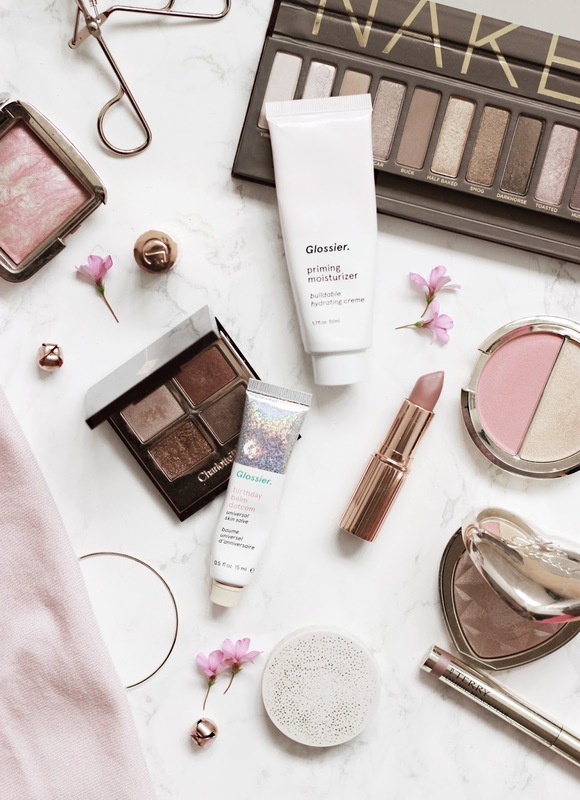 I've decided to prep my lips using the Glossier Birthday Balm Dot Com to ensure that my lips are hydrated and then opt for the Charlotte Tilbury Pillow Talk for colour, a luxurious pick that I don't mind topping up throughout the night. I'm planning on wearing false eyelashes to dress up my look even more, but I want to keep it natural by using a pair of Eylure Fleur Loves Lashes that are great at adding a little bit of volume and length.